The increasing awareness for health & wellness among both older and younger populations, and the resulting growing demand for phytonutrient-rich products globally, have led to advancements in extraction technologies by ingredient manufacturers, and resulted in constant innovations with novel extracts across different ingredient types, such as tocotrienol, carotenoids, flavonoids, and phytosterols. These factors will stimulate the growth of the global phytonutrient ingredients market across different end applications, and especially in the dietary supplements and functional foods segments. How will the agriculture and nutrition industries evolve in 2019? The webinar will explore the future of the evolving market and how technology trends and future collaboration across the food industry will enhance nutrition and health. 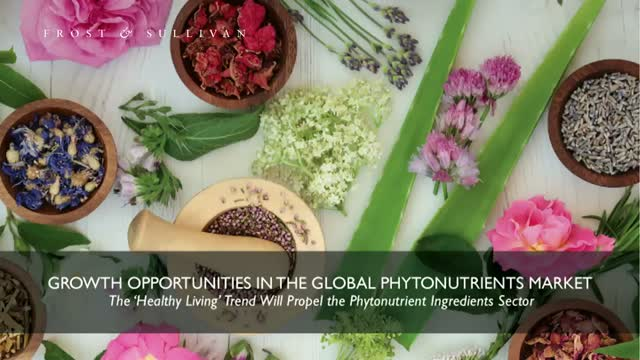 Frost & Sullivan invites you to join our Global Director of Visionary Sciences, Chris Shanahan, as he highlights the technological developments in the field of agriculture, food processing, and other nutrition applications, as well as opportunities for current and potential industry participants. • Learn about IoT trends and traceability for F&B manufacturing that would ensure complete safety and hygiene in food manufacturing plants. • Identify the key challenges that will impact stakeholders and how to overcome these challenges with innovative products and business models. Frost & Sullivan's Visionary Science webcasts provides a comprehensive coverage of markets in established and emerging countries. Our global team of Industry Experts, monitor the use of chemicals and materials in Construction & Utilities; in Food, Drugs & Cosmetics; and in Transportation, in addition to the Food & Beverage Ingredients and Personal Protective Equipment markets.